The government of Bermuda has again proven themselves rather visitor-unfriendly. Customs officers went aboard Norwegian Breakaway this week while it was docked in Bermuda and searched two passengers’ staterooms for drugs, arrested the people, essentially forced a plea bargain on them, and pocketed thousands of dollars in fines. These visitors apparently did not intend to take the drugs ashore. They had small amounts for personal use, and they were not using them in public. One of the people had marijuana for medical reasons (and had just enough at the prescribed dosage to last through the cruise) and was simply ignorant of Bermuda’s laws. We’re not in favor of drugs, but Bermuda’s visitor arrivals are sagging, and the government’s actions are not the way to encourage visitors to come to the island. Visitors tend to avoid places where they are subjected to what they consider unreasonable searches and are then forced to pay large fines or go to jail. All 24 ships of the Carnival Cruise Lines fleet have taken up the Ice Bucket Challenge to benefit ALS and they in turn challenged their corporate office who took it up and passed it on. Along the way, however, Carnival made a $100,000 to the ALS Association. We have the video of the Carnival employees accepting the challenge and the full press release here on our blog. Just in case you didn’t get up in the middle of the night or want to spend three hours watching, Royal Caribbean has produced a video of Quantum of the Seas floating out this week. You can see it all in just over three minutes here on our blog. This week Meyer Werft floated out Quantum of the Seas from the building dock. Prior to it, the two sections of the sister, Anthem of the Seas, had to be moved out of the way. Royal Caribbean provided this time-lapse video of the entire process. We have photos from the process on this blog, which we posted earlier. Update August 18: Carnival Chairman Micky Arison also accepted the #IceBucketChallenge which can be seen on his Instagram account, but more important, Arison made a personal donation to the ALS Association in the amount of another $100,000. MIAMI (August 15, 2014) – Leave it to Carnival Cruise Lines to take the #IceBucketChallenge to another level! The world’s most popular cruise line enlisted all 24 of its “Fun Ships,” as well as President and CEO Gerry Cahill, to participate in the #IceBucketChallenge, designed to raise much-needed awareness and funds for amyotrophic lateral sclerosis (ALS), also known as Lou Gehrig’s Disease. Carnival is also making a $100,000 donation to the ALS Association. The way the #IceBucketChallenge works is simple: participants are encouraged to pour a bucket of ice water over their head and then challenge others to do the same or make a donation to fight ALS within 24 hours. Carnival’s newest ship, Carnival Breeze, was the first ship to rise to the challenge with Cruise Director Matt Mitcham throwing down the gauntlet by dumping the entire contents of the 150-gallon PowerDrencher tipping bucket and then challenging the line’s other 23 ships to take up the cause. Team members from the 23 ships – which are sailing in regions spanning the Caribbean, Alaska, the West Coast and Australia – were up to the task, with shipboard personnel undergoing their own below-freezing drenching to support ALS research, treatment and education efforts. The #IceBucketChallenge was then extended to Senior Cruise Director and Brand Ambassador John Heald who is sailing, appropriately enough, in the icy waters of Alaska on the Carnival Miracle. Fresh from his drenching, Heald then challenged President and CEO Gerry Cahill who, surrounded by dozens of the company’s employees, underwent his own frigid encounter at the company’s Miami headquarters. And just to keep the momentum going, Cahill challenged popular comedian and TV personality George Lopez – the line’s “curator of comedy” who helped create the fleetwide Punchliner Comedy Clubs – along with Food Network star Guy Fieri whose namesake Guy’s Burger Joints are on several ships and DJ IRIE, the line’s official DJ whose Spin’Iversity trains Carnival DJs fleetwide. All three gentlemen gladly accepted the challenge! Those who wish to donate to the ALS Association may do so by clicking here. When Regal Princess arrives in the Caribbean, in addition to the ship, Princess’ new regional dining will be making their debut. The new menus include highlights of the cuisine of the destination. In this case, Regal’s menu will highlight the Caribbean. It’s only a couple of weeks until Oasis of the Seas leaves the Caribbean temporarily for a short trip to Europe that will include a few short cruises and the main reason for the trip, a routine drydock. The program will include two transatlantic crossings. But there are signs the two crossings may not have had the demand Royal Caribbean hoped for. Regal Princess entered service in Europe in May, and technically, it has been sailing without a name, because there was no christening when it entered service. Princess said that would wait until the ship arrived in the US for its inaugural Caribbean season. And now we see why. That celebration in November will kick off the cruise line’s 50th anniversary year of 2015, and judging by the special event they have planned for Regal Princess, it’s going to be quite a year. A mechanical problem is causing Cunard to send Queen Victoria to dry dock a year before one was planned for a major refit. Since it’s there, Cunard has decided to go ahead and add the various enhancements now, both above and below decks, which will make Queen Victoria even better for all of 2015. 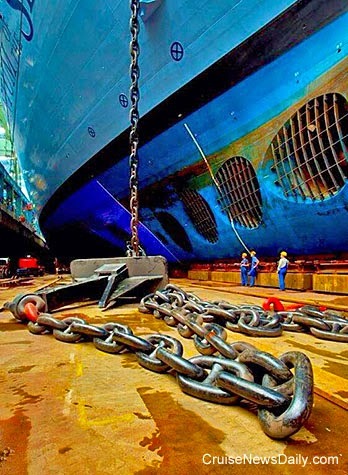 The drydock is now scheduled at Hamburg’s Blohm+Voss shipyard beginning January 3 (2015). The ship will return to service with its January 20 World Cruise. Early this morning (in Germany - overnight in the US) Quantum of the Seas was slowly floated out of the covered building dock at Meyer Werft. 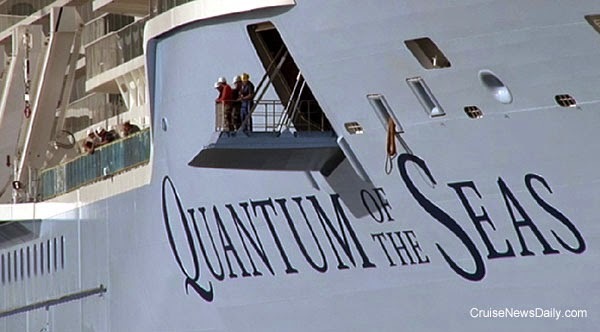 The experts made short work of it, because within about three hours, Quantum was docked at the finishing dock. By this afternoon, finishing work had already begun. 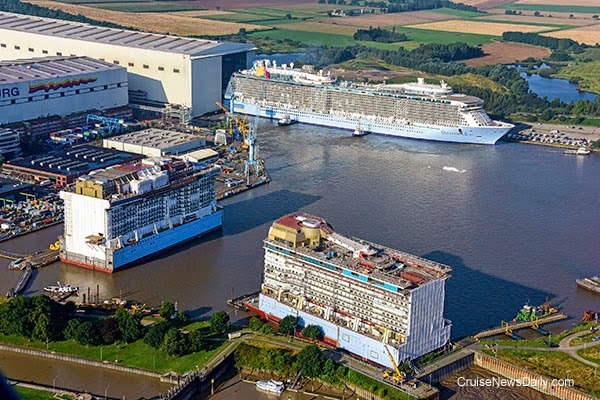 Meyer Werft floated out Royal Caribbean's Quantum of the Seas at first light this morning at their Papenburg facility. 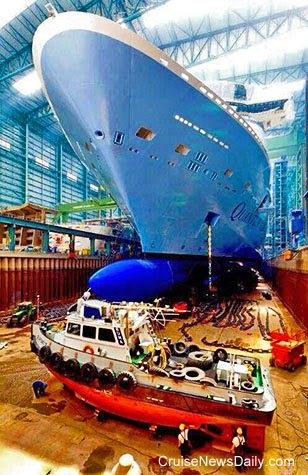 Quantum of the Seas is seen here with two sections of Anthem of the Seas. One was already floating in the lagoon, while another was in the building dock ahead of Quantum and had to be towed out last night. They were moved several times during the procedure this morning to make way for the completed ship. They will replace Quantum in the building dock and be joined to eventually form the next sister ship in the series. Within three hours Quantum of the Seas was docked at Meyers finishing dock, and by this afternoon, completion work had already begun. In this photo you can see the funnel housing being lifted to the exposed stacks (just behind the light blue crane on the left). Behind the housing and across the lagoon you can see one of the sections of Anthem of the Seas having been moved from the previous photo, and on the bridge to the right, you can see some of the yellow lifeboats lined up ready to be lifted and latched into place on Quantum. Photo copyright Meyer Werft and Cruise News Daily. All rights reserved. May not be copied or used without permission. During the night tonight (US time), if all goes according to plan and the weather cooperates, Meyer Weft will float out Quantum of the Seas. So this afternoon, Royal Caribbean decided they’d better mention something people are going to see on the top deck - something no other cruise ship has - a 30-foot pink polar bear. * Could News Media Reports Be Misleading? CLIA today issued a press release applauding the findings of a recent report by the Centers for Disease Control and Prevention (CDC) on norovirus. The report found that norovirus on cruise ships is relatively rare compared to the number of incidents on land. When Quantum of the Seas floats out at Meyer Werft Wednesday morning, it will have something no other ship has. Photo and video courtesy of Royal Caribbean International. All rights reserved. May not be copied or used without permission. 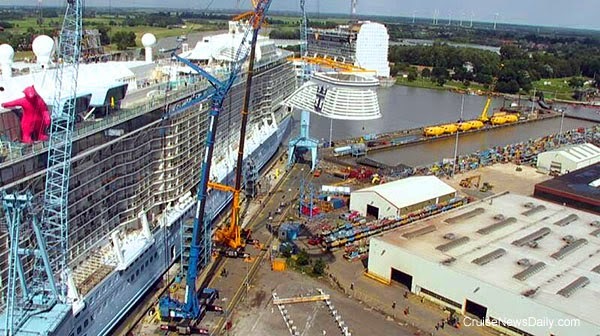 Update August 12: There has been a further delay to the float out of Quantum of the Seas. Weather is still preventing the undocking of Quantum of the Seas and the movement of the two sections of Anthem of the Seas. Apparently the movement of the Anthem sections in strong wind gusts is the major issue. The Anthem sections are in the way of Quantum, and until they can be moved, Quantum can't be moved. The process is now scheduled to begin Tuesday evening at 8:00pm (2:00pm Eastern US time) with the moving of the Anthem of the Seas sections. The actual float out of Quantum of the Seas will now occur around 6:00 am on Wednesday, August 13 (just after midnight Wednesday morning in the US). It should be docked at the outdoor pier about three hours later. Times are still subject to weather conditions. There’s a dilemma in Mobile, Alabama. They still want a cruise ship to home port there. They have this new, slightly used terminal, but currently no cruise ship, and no imminent prospects to get one. They are also building a new highway bridge (for I-10) across the Mobile River, and any cruise ships that come to Mobile will have to go under it to get to the cruise terminal. Their dilemma is if they should they build it high enough to accommodate the ship they don’t have anymore. Or should they pay more to build it even higher to accommodate bigger ships they don’t have either? And if they go the second route, how much higher should it be to accommodate other ships that have shown no interest in coming to Mobile? 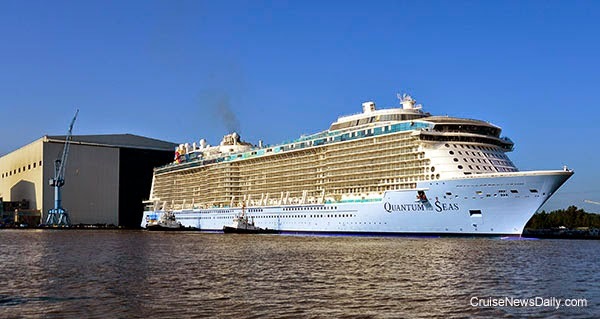 A 68-year-old American man quietly went overboard from Royal Caribbean’s Grandeur of the Seas last Wednesday night as the ship traveled from Bermuda to Baltimore. 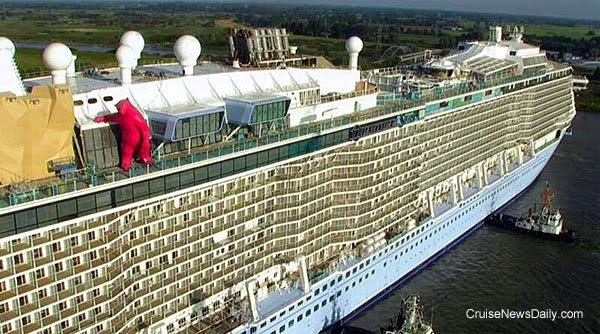 A 29-year-old Chinese woman drowned in one of Sapphire Princess’ swimming pools last Thursday during a short cruise from Shanghai. Meyer Werft has been readying Royal Caribbean's Quantum of the Seas to leave the building dock, and they have provided us with these stunning pictures. Often as the ship is being towed stern-first out of the building dock, you'll notice a tug boat at the bow. In the second photo, you'll see that tug boat already in position at Quantum's bow. Have you ever wondered how it gets there? Meyer says they pick it up with a crane and carry it around the ship and place it there. They make it sound so simple. Photos courtesy of Meyer Werft. All rights reserved. May not be copied or used without permission.